Sign-up and receive Property Email Alerts of Commercial New Developments in Mount Edgecombe, Mount Edgecombe. This prestige industrial development is located on Lot 74 and offers a completely different product more in line with a “midi” complex where unit sizes vary from 1,220m² to 2,559m² and even bigger if required. The developers are able to adjust gridlines to provide more or less the size of unit that potential clients may require. The units suite a light industrial/warehousing type operator. 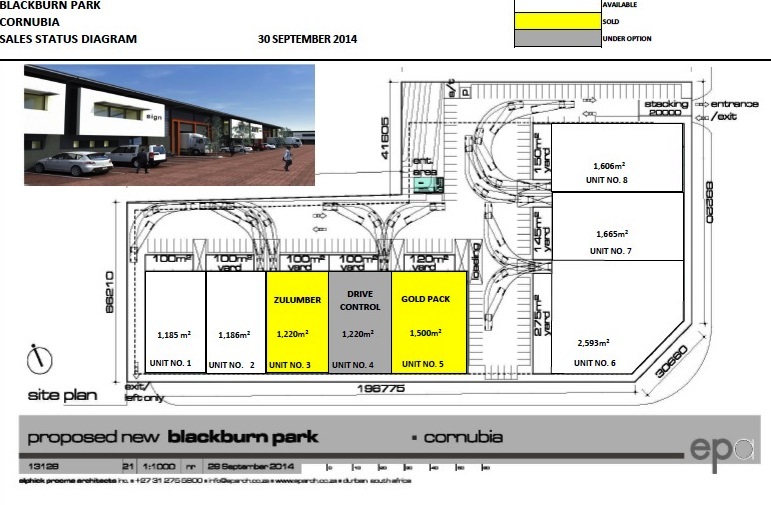 Blackburn Park, as it will be known, offers dedicated walled off yards as well as warehouse stacking heights of 7.5m. The complex will be fully sprinkled. The project has been designed to come in at a selling range of R6,375/m² to R6,875/m² and will be sold on a co-development basis. The Co-Development Process is a means of developing office and other buildings at cost for shareholders who would otherwise generally not be able to develop on their own due principally to the smaller scale of end user space requirements.